FILE - A U.S. Marine takes part in a training session for Afghan army commandos in Shorab military camp, Helmand province, Afghanistan, Aug. 27, 2017. The U.S. is shifting combat and intelligence-gathering aircraft to Afghanistan as part of an intensified focus on the Taliban, now that the campaign against the Islamic State group in Iraq and Syria is winding down, the commander of coalition air forces in Afghanistan said Wednesday. Air Force Major General James Hecker told reporters at the Pentagon in a video teleconference from Kabul that on February 1 the U.S. Central Command officially designated Afghanistan as its "main effort," supplanting the counter-IS campaign in Iraq and Syria. Central Command is responsible for all U.S. military operations in the broader Middle East and Central Asia. "This behind-the-scenes legwork allows us to hit the Taliban where it hurts most, whether it's command-and-control ... or their pocketbooks," Hecker said. 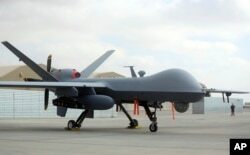 He said the U.S. now has 50 percent more MQ-9 Reaper drones providing intelligence, surveillance and reconnaissance in Afghanistan compared with last year. "We are putting unrelenting pressure on the enemy these days," Hecker said, with a goal of compelling the Taliban to reconcile with the government. That goal has been pursued by U.S. commanders in Afghanistan for much of the past 16-plus years, without success. "You're not just going to bomb them into submission," he said. "But it is another pressure point that we can put on them," in addition to ground combat operations led by the Afghan army and special operations forces.